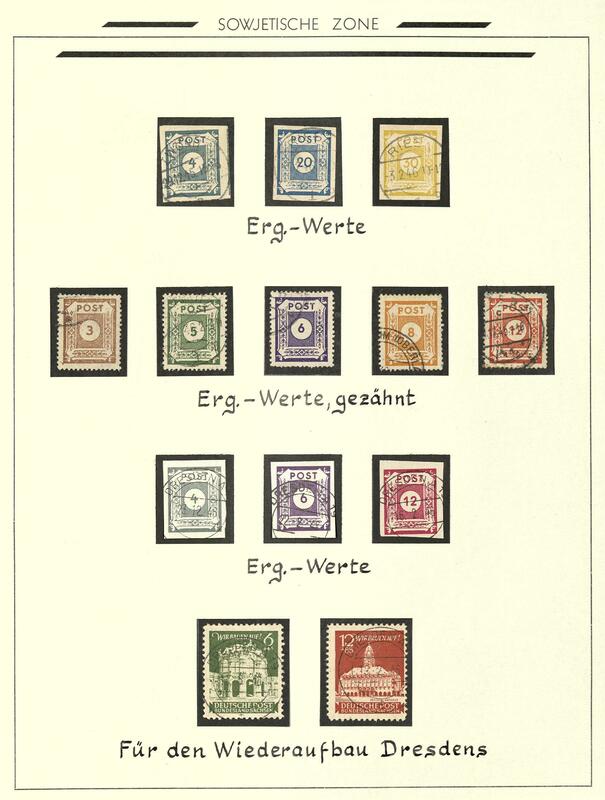 802 ⊙ Southwest Africa - used collection on hingeless preprinted pages, slightly mixed condition, with superb pieces. With also 5 Mk. Ships without and watermarked used and so on. 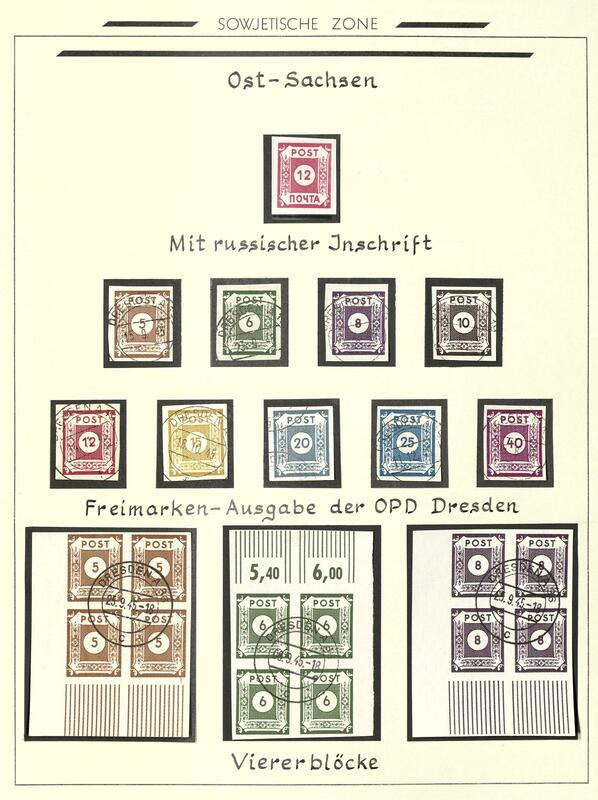 5L / Soviet Zone / German Demokratic Republik (East Germany) - extensive collection, predominantly mint never hinged formed housed in five albums. 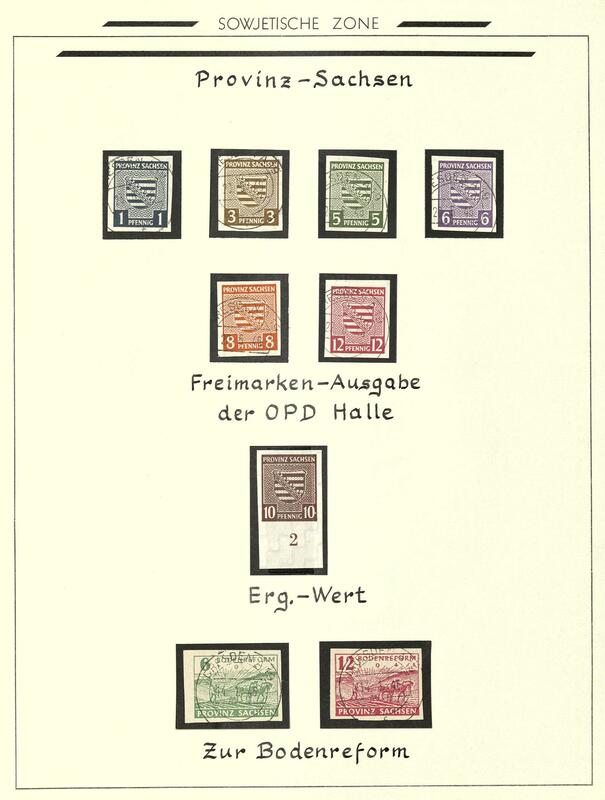 As well the Soviet Zone very represented strongly including all souvenir sheets, herewith large and small Christmas souvenir sheet in each case in both paper types, as well German Demokratic Republik (East Germany) with a strengthened part ZKD-editions. Please check carefully! 20P ⊙/ / Soviet Zone / German Demokratic Republik (East Germany) - interesting lot souvenir sheets Soviet Zone and German Demokratic Republik (East Germany) in the Lindner ring binder accommodated. 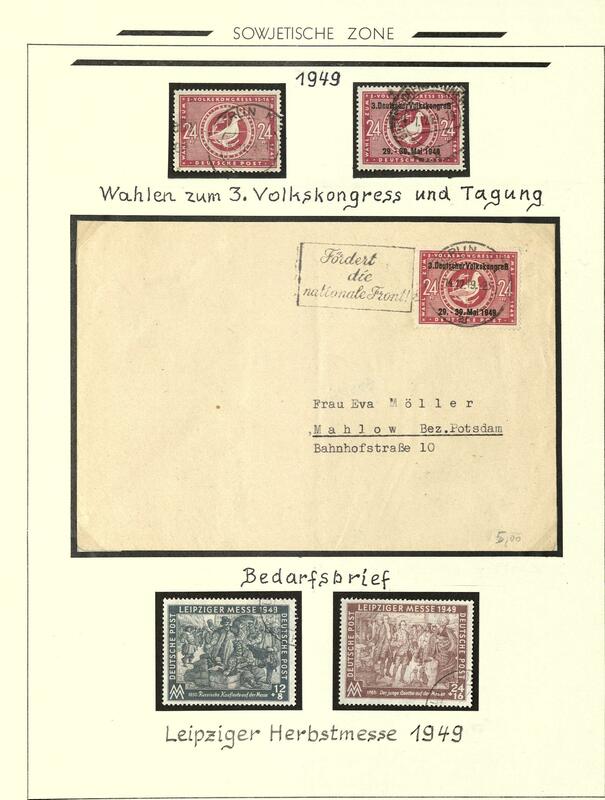 With also the large Christmas souvenir sheet on white paper used (stamp without guarantee), German Demokratic Republik (East Germany) with DEBRIA-souvenir sheet twice, Engels-souvenir sheet twice and much further material. Favorable valued! 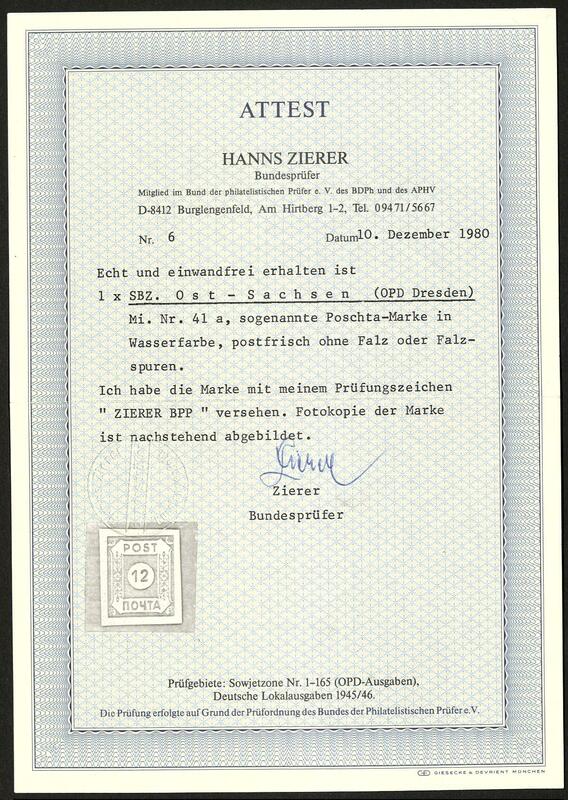 22 /⊙/ Soviet Zone / German Demokratic Republik (East Germany) - rich collection in the ring binder with plenty of better issues, as well Soviet Zone with souvenir sheet 1 / 6, mostly with photo certificates respectively photo attests provided, bridges building centerpieces, with also Hz1 cy in perfect condition mint never hinged with photo certificate Schulz BPP, as well German Demokratic Republik (East Germany) with good first issues pending three times pro issue. Please have a look! 44 150/55X Soviet Zone / German Demokratic Republik (East Germany) - 1945 / 89, nice collection, almost exclusively mint never hinged formed in three lighthouse spring back binders. 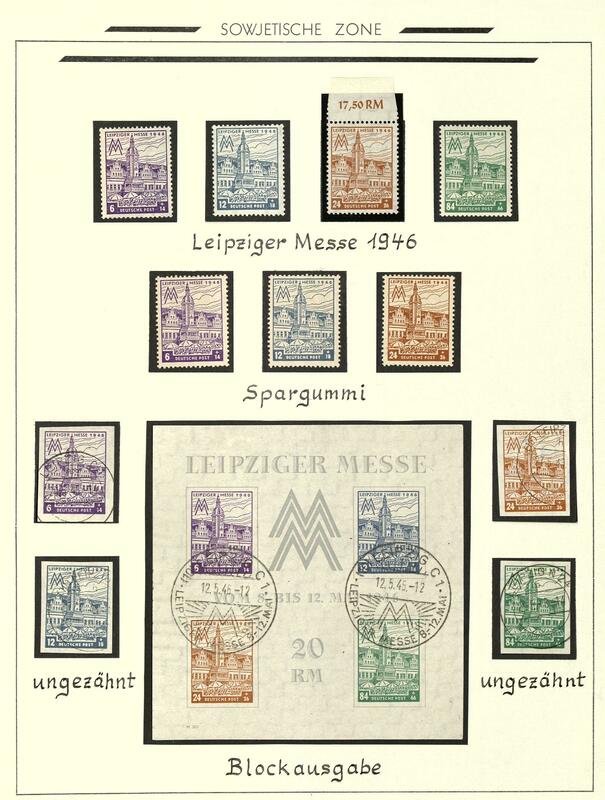 As well the Soviet Zone with many complete sets, Leipzig fair souvenir sheet 1946 with both watermark, Goethe souvenir sheet 1949, Michel no. 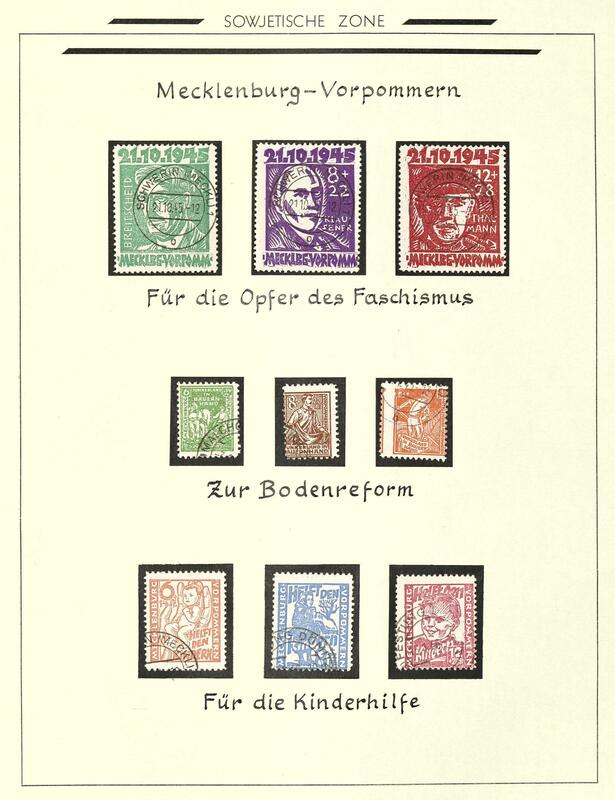 150 / 55 X (4 values), as well the German Demokratic Republik (East Germany) from 1949 / 89 complete mint never hinged with all better sets and souvenir sheets of the early years. A magnificent object! 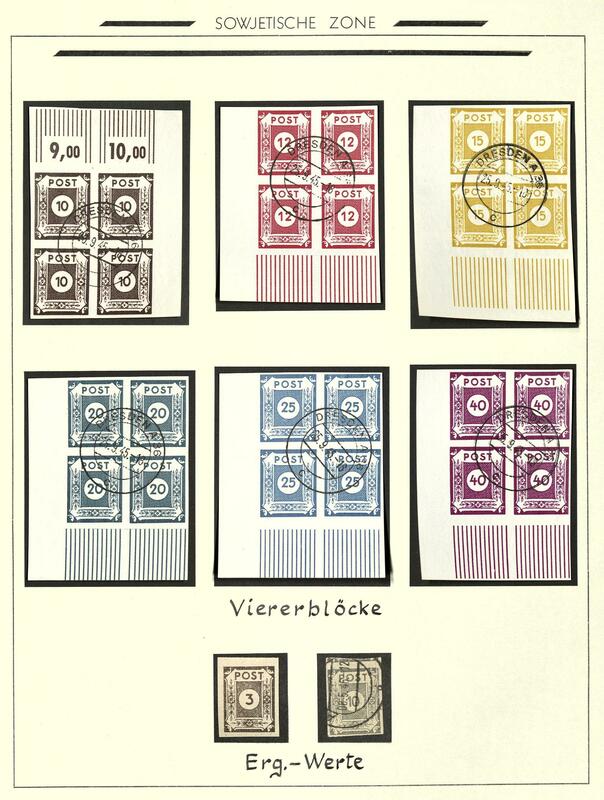 98C /⊙/ /✉ Soviet Zone / German Demokratic Republik (East Germany) - 1948 / 90, extensive collection from the currency reform in six albums formed (without the years 1971 / 75). 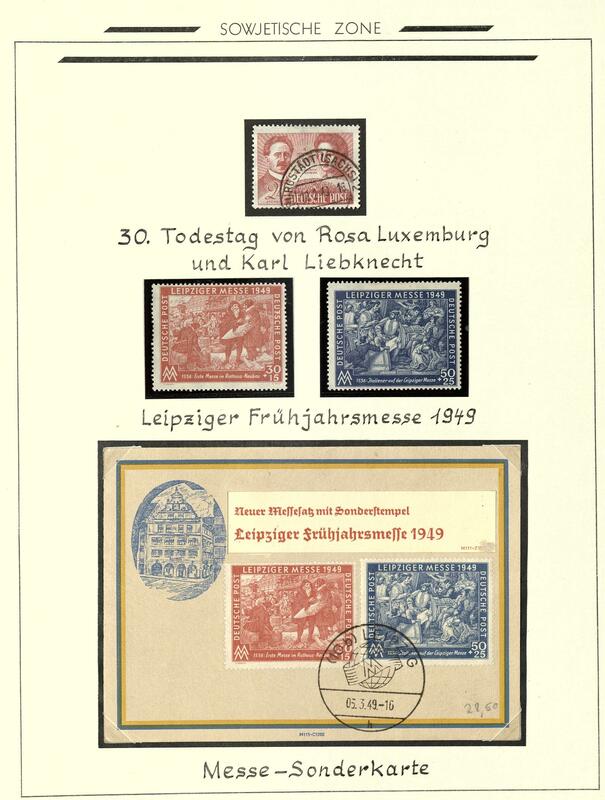 As well better issues of the early years, including Marx souvenir sheet, service- and ZKD values, as well numerous covers, cards and First Day Cover including better issues of the early years and so on. Must see! 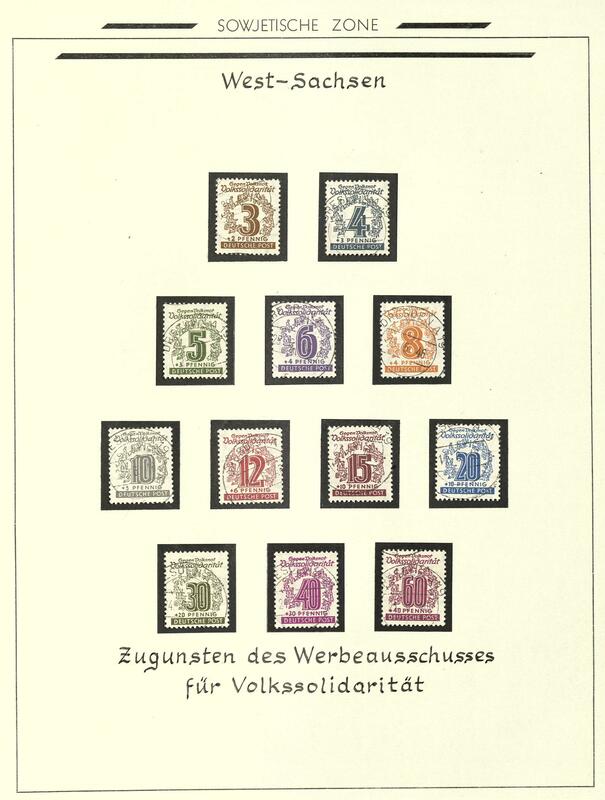 969 /⊙/ Soviet Zone / German Demokratic Republik (East Germany) - 1945 / 64, extensive inventory en masse thick stockbook accommodated with a large amount of material, usually placed close to each other. 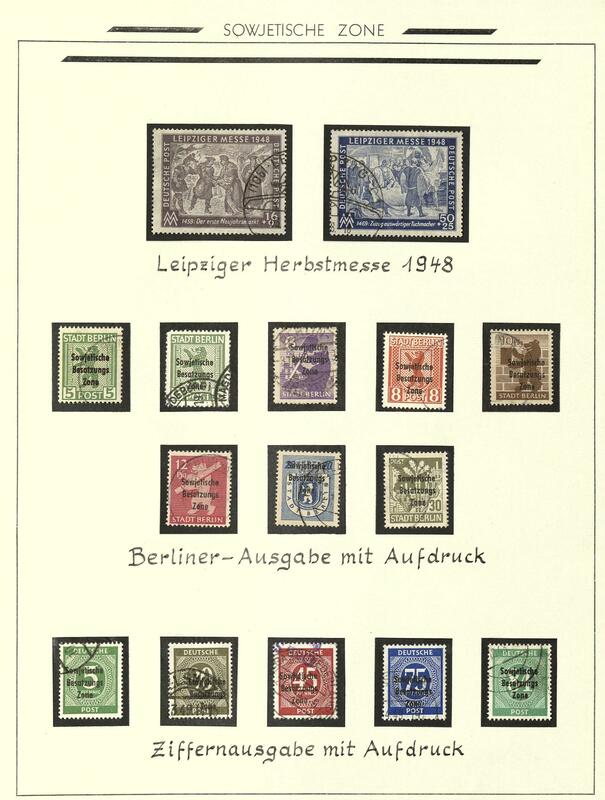 As well the Soviet Zone from the bear-edition extensively present with numerous complete sets, as well German Demokratic Republik (East Germany) with many beginning valued, better sets including academy 1950, many special- and commemorative issues from the fifties and so on. Enormous catalog value! 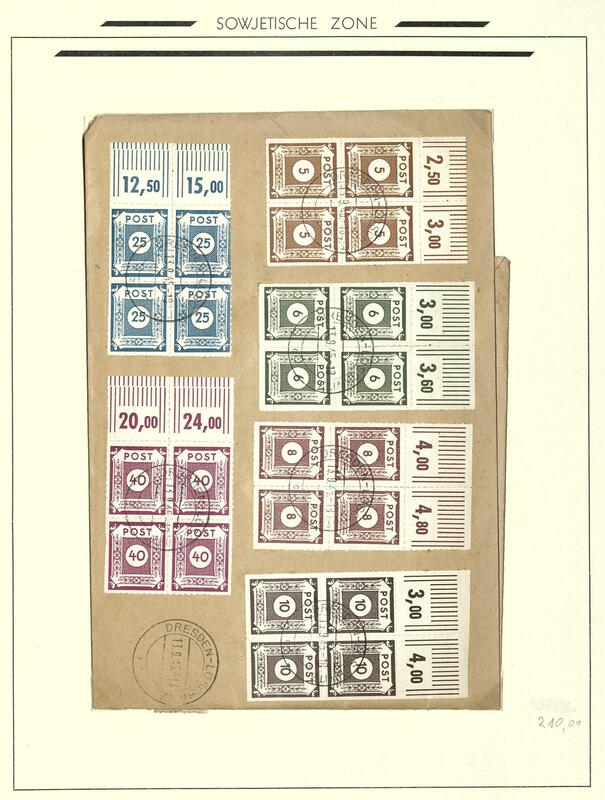 1973 /⊙ Soviet Zone / German Demokratic Republik (East Germany) - 1949 / 90, a huge inventory souvenir sheets and miniature sheet en masse card box accommodated with an enormous amount of material. 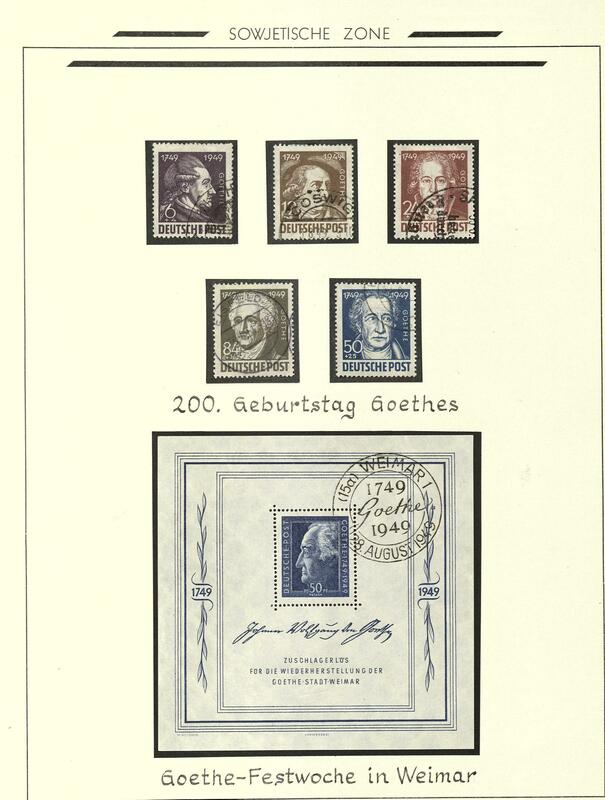 With also many better issues the early years as for instance Goethe souvenir sheet 1949 three times mint never hinged, DEBRIA-souvenir sheet three times mint never hinged and once again on registered cover with three-colored special cancel, 10 Marx souvenir sheet 1953 used, Engels-souvenir sheet 1959 six times mint never hinged and three times used, Buchenwald souvenir sheet 1958 twice mint never hinged and twice with special cancel, as well enormously much further material to the last issues, nearly all many times presented including numerous miniature sheet. Enormous amount of material with gigantic catalogue value! 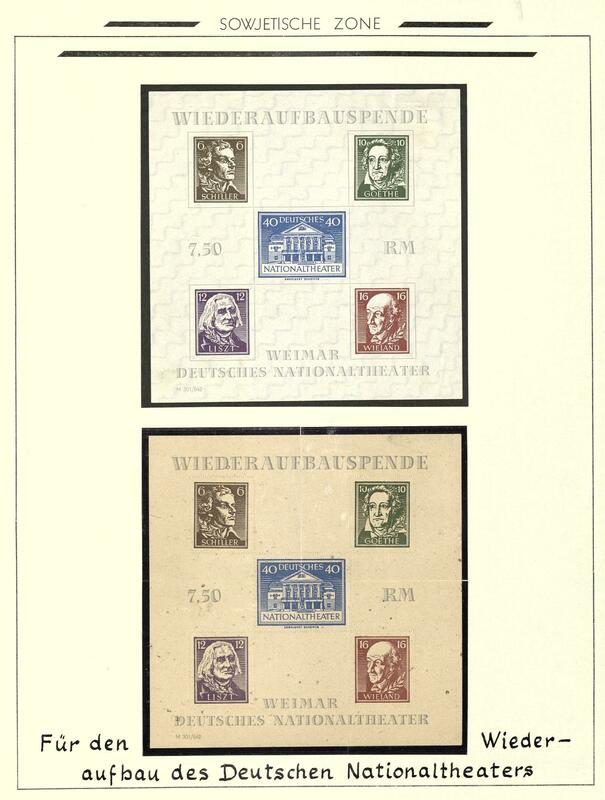 2178 /⊙/ Soviet Zone / German Demokratic Republik (East Germany) - 1945 / 90, rich collection in four printed form albums formed, as well Soviet Zone with numerous different issues including complete sets, as well an extensive part German Demokratic Republik (East Germany) from the beginning years with numerous blocked value series, souvenir sheets, complete volumes and so on. Enormous catalog value! 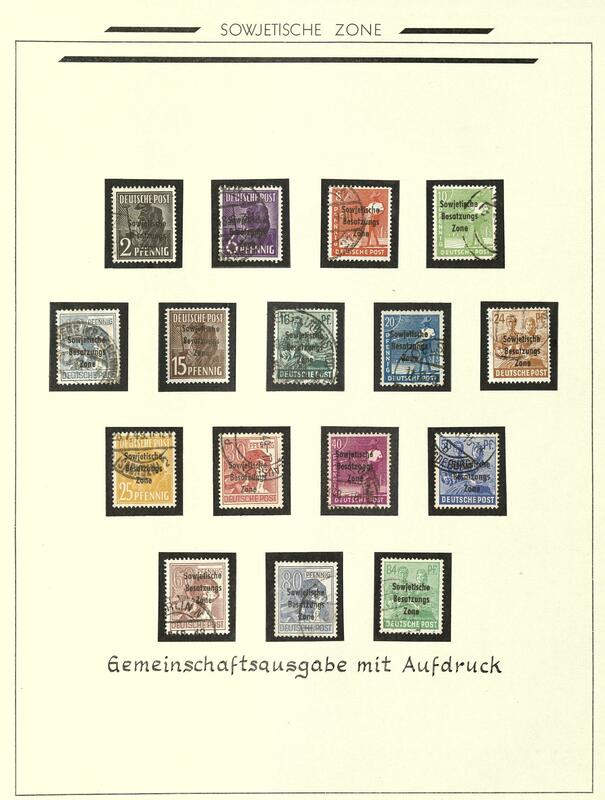 2259 ✉ Soviet Zone / German Demokratic Republik (East Germany) - interesting and extensive inventory of more than 800 covers, cards and First Day Cover with numerous attractive documents from the fifties. 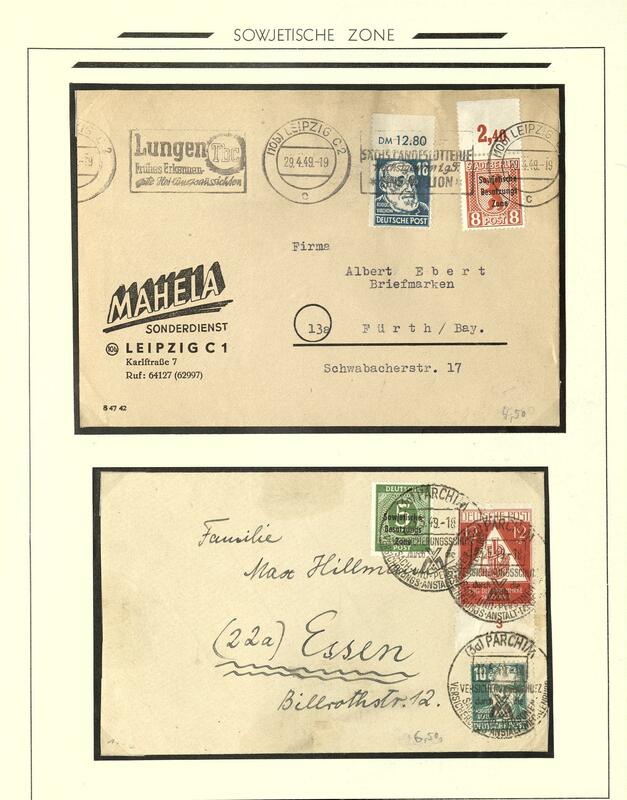 With also older covers to Australia used, legitimate postage, single- and multiple franking, numerous illustrated First Day Cover, registered and so on. Favorable! 1M /⊙/ Soviet Zone - interesting collection in the ring binder with a lot of better issues, with also all souvenir sheets and so on. Must see! 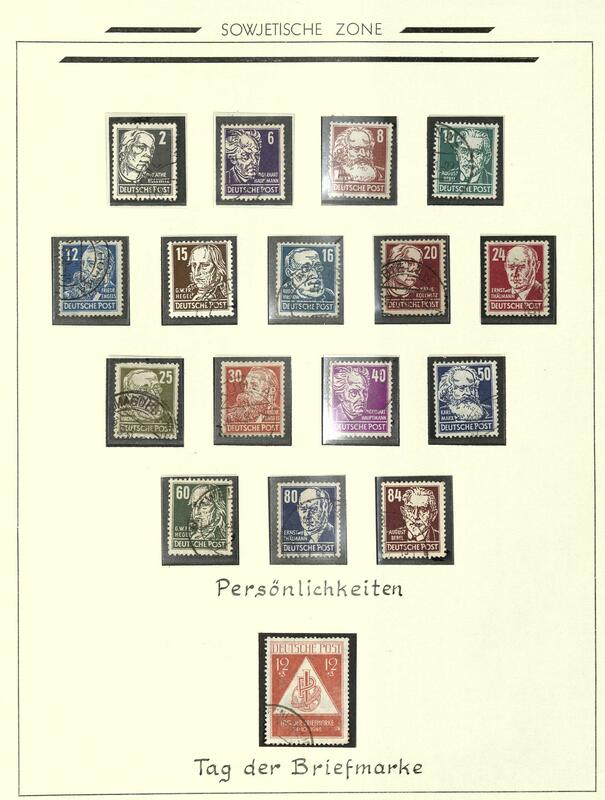 1T 51 Soviet Zone - extensive special collection the sheet, almost exclusively mint never hinged formed with numerous interesting variety, plate flaws, different printing plates and so on. In four lighthouse ring binder. As well an extensive part city Berlin, East Saxons very extensively present, as well country Saxony and West Saxons. Into the bargain an extensive special stock the Michel no. 51 in a large stockbook. Please check carefully! 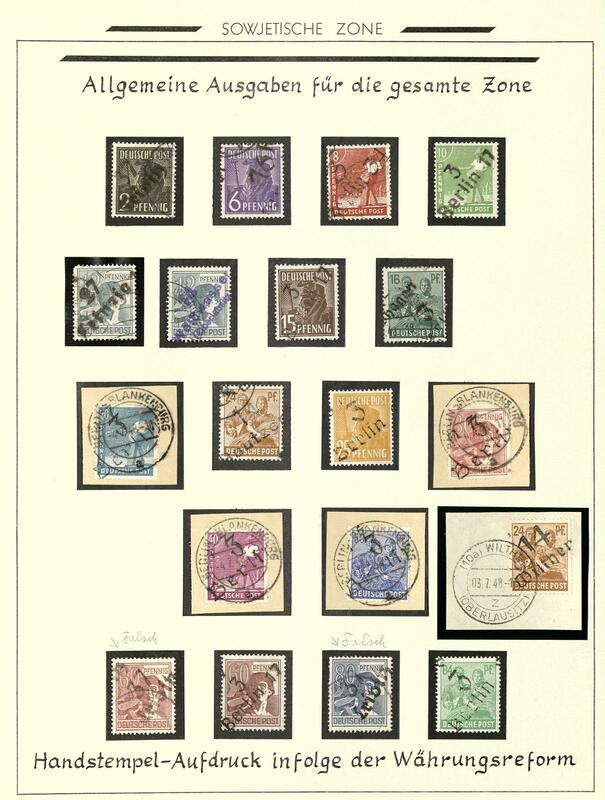 35J /⊙/ Soviet Zone - rich collection mounted on pages very fine with inscription mounted with plenty of better issues, the used values still not expertized thus without guarantee. Is included also the 12 Pfg. 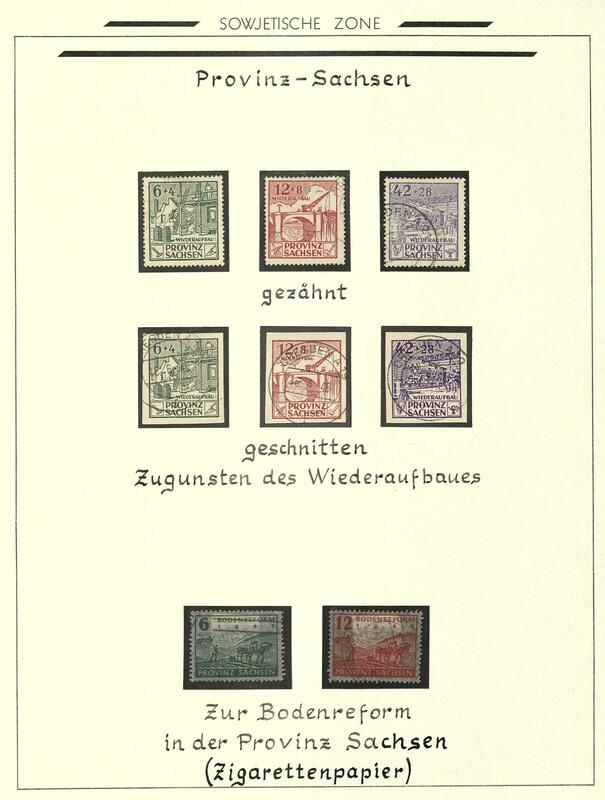 Potschta mint never hinged in perfect condition with photo certificate Zierer BPP (watercolor), bridge building souvenir sheet centric cancellation and numerous further issues, complete sets, Goethe souvenir sheet 1949 with appropriate special cancel from Weimar and so on. Very favorable! 98D /⊙/ /✉ Soviet Zone - 1945 / 48, rich collection in the thick spring back binder formed with plenty of better issues, specialized. With also 12 Pfg. 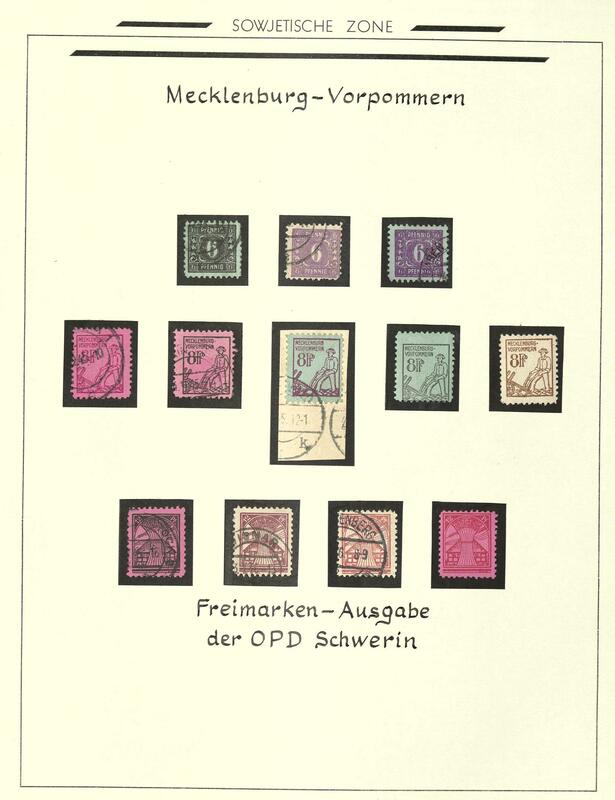 Potschta, all souvenir sheets, as well also numerous covers and cards with attractive documents, legitimate postage, different use form and postage steps, registered, as well as well German local issue. 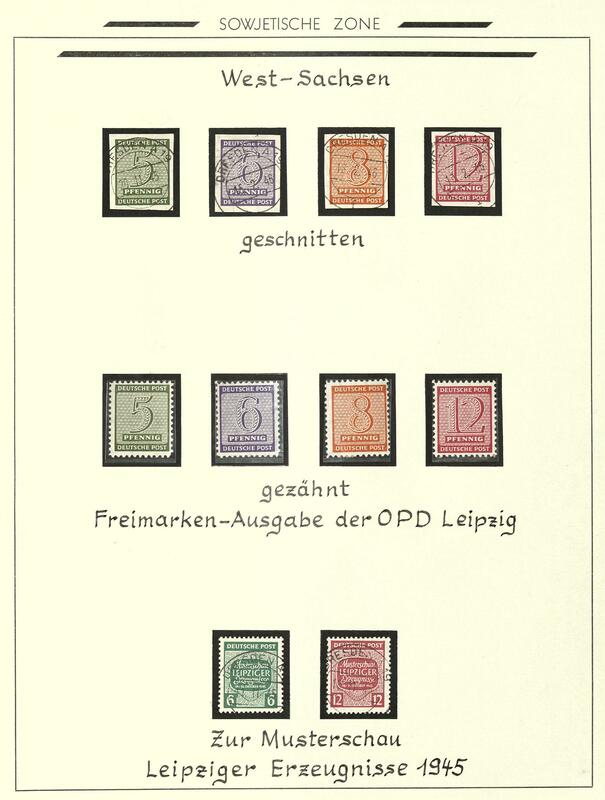 Is included also a rare commercial letter the 12 Pfg. Schwarzenberg with skyline in combination with 10 Pfg. With round black over painting from \"SCHWARZENBERG c 3.7.45. \" to Aue with in detail legitimate text. An impressive object! 99C x Soviet Zone - interesting inventory packed in a carton, as well lots of mint never hinged material, numerous better issues, often in larger numbers of pieces, many varieties, including unperforated values, perforation varieties, better watermark and so on. Great treasure trove and perfect for liquidation, very high, five-digit catalogue value! 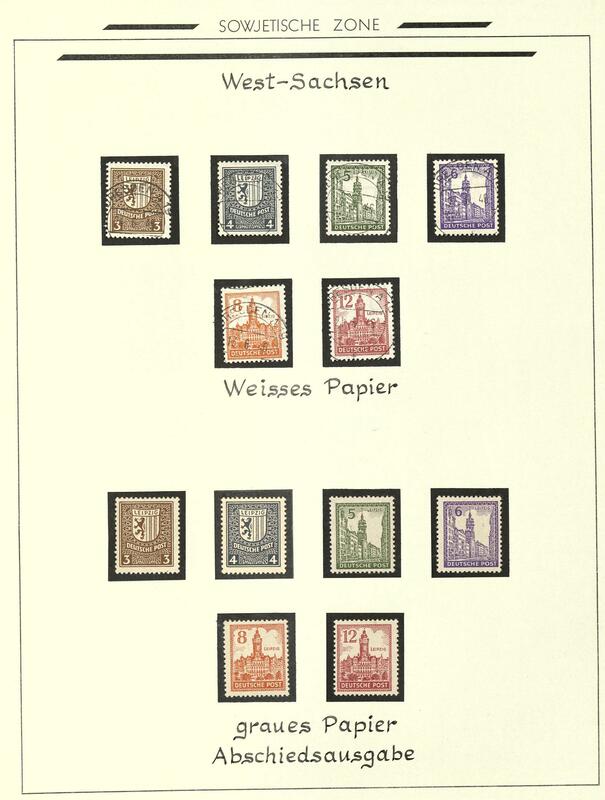 103A ✉/ / Soviet Zone / West Saxons - interesting and extensive special collection in the thick album accommodated. 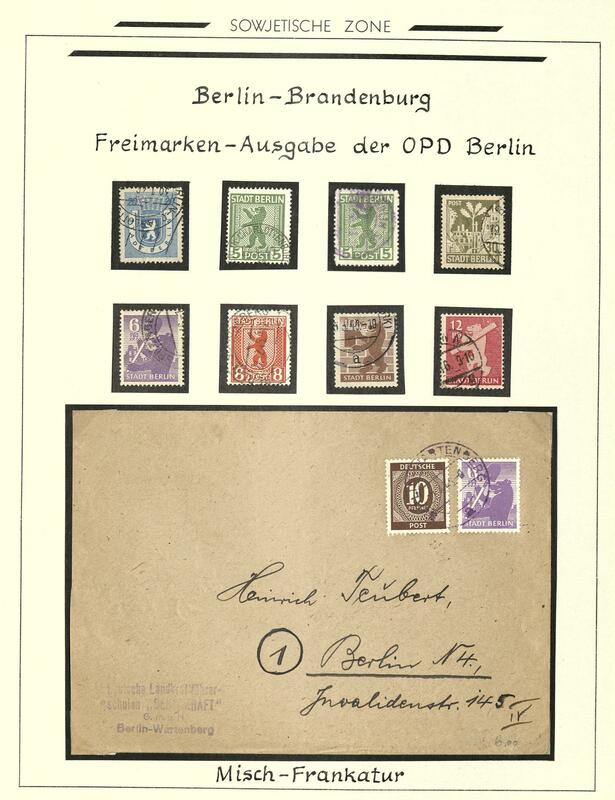 As well complete original sheets, numerous covers with interesting documents, sought-after frankings, registered, different use form and postage steps, legitimate postage, single- and multiple franking, postal stationery, se-tenant with useful issues including Leipzig fair 1946, as well a number of gutter pairs and so on. An extraordinary object! 107 /⊙/ /✉ 46DIIa, Mi. € Soviet Zone / East Saxons - interesting collection in the Schaubek album. 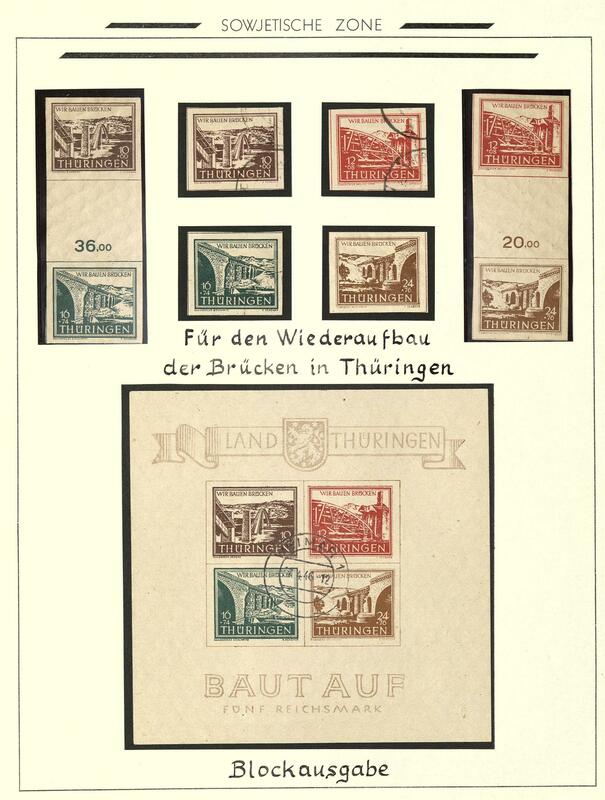 As well stamp issues, however lies the main value on the numerous covers, as well a very nice part legitimate postage with single- and multiple franking different denomination value, mixed use form, 12 Pfg. 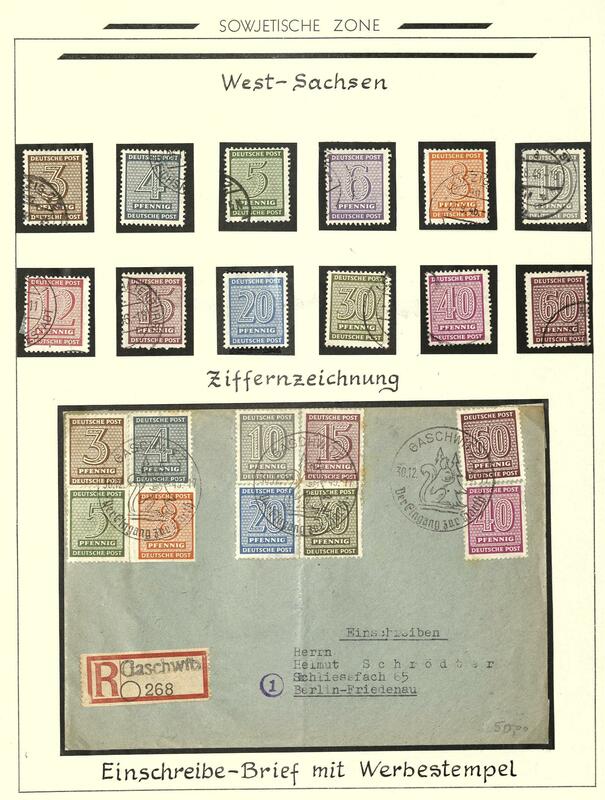 Potschta on cover with CTO, postal stationery, sheet and parts of sheets, with also postmaster separation Coswig 12 Pfg. 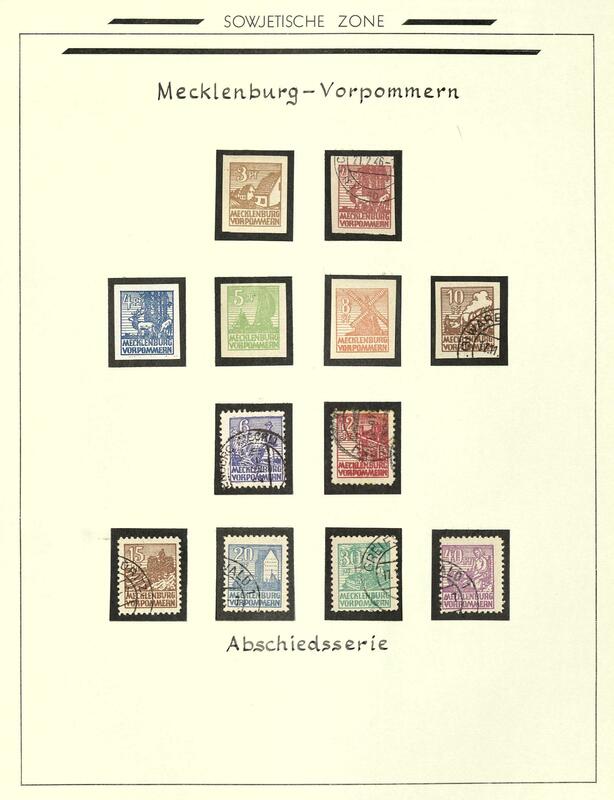 In the mint never hinged original sheet to 100 values expertized Ströh BPP (Michel no. 46 DIIa, Michel 2000,- €) and so on. A magnificent object! 121 /⊙/✉ Soviet Zone / West Saxons - nice and extensive inventory on numerous stock cards in two boxes accommodated with enormous amount of material, often stacked closely one above the other, clean sorted, as well popular issues, numerous complete sets, various watermark, paper types, expertized issues, colours and so on. Enormous catalog value! 122 /⊙ Soviet Zone / MECKLENBURG-WESTERN POMERANIA - interesting and extensive lot on stock cards in a box accommodated. 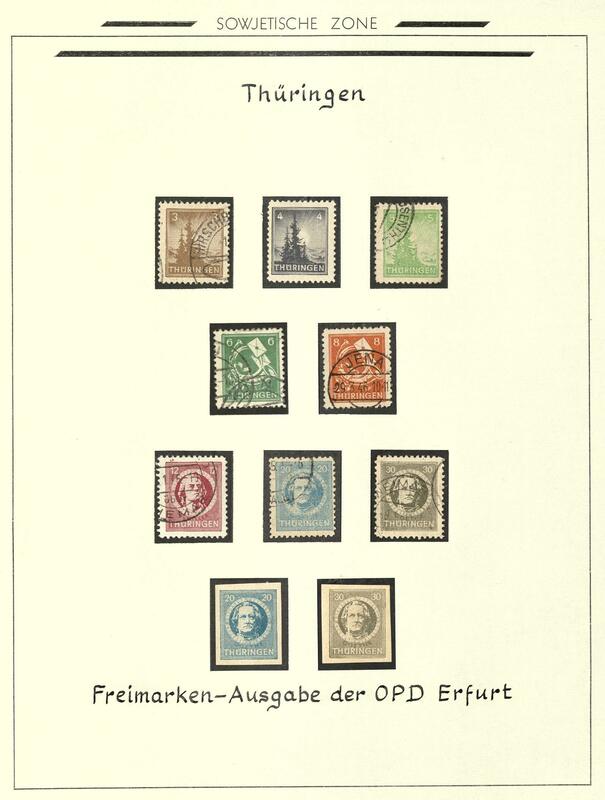 As well better issues, expertized values, colours, a number of sets anti-fascist, a nice part childrenÂ´s help, with also numerous plate flaw, farewell issue with better values and different documents and so on. Enormous catalog value! 123 /⊙ Soviet Zone / East Saxons - interesting and extensive inventory on stock cards in a box accommodated with lots of better values, numerous expertized issues, clean sorted, often stacked closely one above the other, also the 12 Pfg. 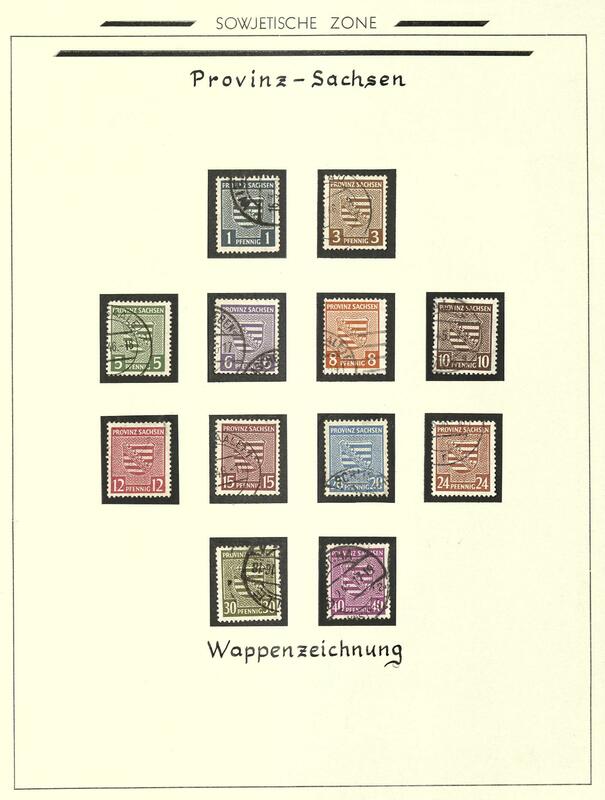 Potschta from upper margin on cover with CTO, the numeral stamps with numerous expertized issues, colors, shades, mixed paper types, also private perforation and so on. An interesting and versatile lot!